The No. 35 Oregon Ducks women’s golf team saw themselves move up one spot after all the second rounds were completed, coming in at 19th after a second round of play that saw them perform much better as a squad. Though inclement weather did halt some other groups from finishing their rounds on Tuesday, the Ducks shot a 295 as a team after a first round performance of 301. Cassy Isagawa continued to pace the Ducks, shooting a 71 on the day for Oregon’s top score in the round. Her two day total now stands at 146 and she is currently in a tie for 23rd on the individual leaderboard, currently finding herself one-under par. Hanule Sky Seo vastly improved her 79 from round one, shooting a 72 on Tuesday to move up into the second position for the Ducks. Her two-day total of 151 put her even and in a tie for 67th overall. Caroline Inglis slipped a little on day two after pacing the Ducks with a 74 in the first round. Shooting a 77 in round two, Inglis’ total now sits at 151. Her performance in round two also resulted in her being three-over par, putting her in a tie for 90th overall. Like Isagawa, Sky Seo and Cali Hipp also improved on Wednesday, shooting a 75 after a first round score of 76. She is at six-over and in a tie for 104th. Avery Sills joined Inglis in slipping a little bit on day two, shooting a 79 after she recorded a 76 on day one. Her score did not factor into Oregon’s team score on the day and put her at twelve-over for the Championships, a score that sees her in 126th. Southern California has maintained their lead in the tournament, shooting a 276 in round two to hold back the advancing Alabama Crimson Tide, who are currently in second. Duke, UCLA, Purdue and Stanford currently round out the top five, with Purdue and Stanford in a tie for fifth. 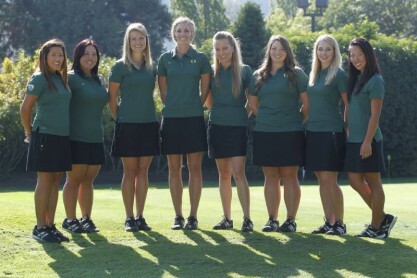 Oregon wraps up play at the championships today.